It seems that the Apple iPad, despite selling like hot pies, is still out of reach of the average Joe. According to recent stats, around 40 percent owners of Apple’s famed tablet are usually the rich people with incomes more than $100 K (Rs. 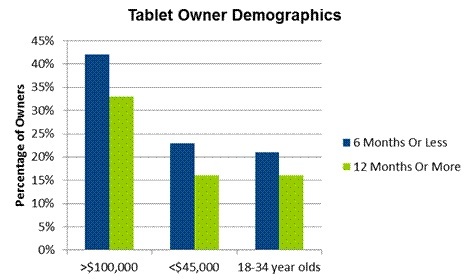 50,00,000) per year while only a fifth of Android tablet users match up in comparison. Not surprising though, as there is a range of Android tablets available in the market that beat the iPad by a great margin when it comes to pricing. In case, you don’t happen to be an ultra-rich Apple aficionado, there is a tablet out there for every range. Heck, we Indians are spoilt for choice when it comes to tablets and the decision to buy an iPad is actually. Whether it is an Aakash (Rs.1750) or a Wespro (Rs. 5,999) there are just so many Android tablets you can buy in the price of an iPad. Looking at it from an Indian perspective, the iPad is a stud. There is no denying that. But we still look forward to something that fits better into our pockets. Top 5 luxury cellphones – Dream on!